“Narrative Analysis” is EVERYWHERE in America today. It wasn’t this way a decade ago. It IS the zeitgeist. Get used to it. AND learn about it, or be lost. TOURNEY NARRATIVE: The New Yorker has a nice article today about how the coaches (and one wife) make for better storytelling these days than the players. I’m tellin’ ya, it wasn’t like this just a decade ago. Nobody talked to the President about, “the Democratic party narrative,” as Jon Stewart did a couple years ago on his show. News pundits didn’t sit around and discuss, “the NRA narrative,” as they have for the past couple months. And sports writers didn’t break down a simple basketball tournament the way that Ian Crouch does today in The New Yorker. But his analysis is actually very good. He explains why there’s so much more interest in the basketball coaches rather than players in today’s NCAA Basketball Tournament. It’s because the coaches are interesting characters — they have backstories, personalities and distinctive styles. Players are young, faceless, temporary, and largely without any depth of character. It’s very true. The biggest matchup this past weekend was between coaches Bill Self (of my beloved Kansas Jayhawks) and Roy Williams, the former Kansas coach. THAT was a good story, but it had absolutely zero to do with the players. 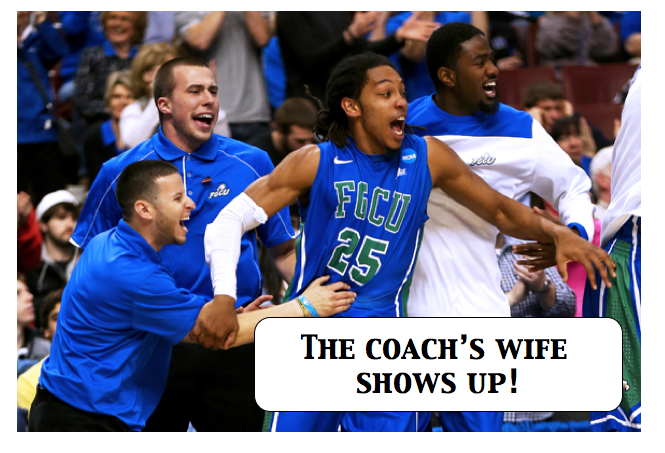 Same for the biggest story of the weekend — Cinderella team Florida Gulf Coast — it’s all about the coach, Andy Enfield and his Victoria’s Secret wife (who doesn’t even get a name in the New Yorker article!). The point to notice is this whole idea of “narrative analysis.” It’s everywhere. And at the center of it is storytelling. Which is why Dorie, Brian and I have developed our storytelling workshop over the past two years and are now writing a book about it. Welcome to “the narrative” of today’s communication.